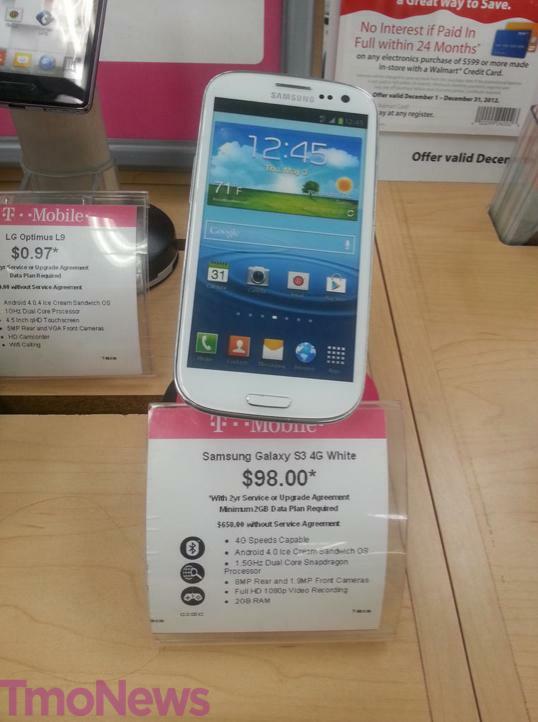 Looking to score a Samsung Galaxy S III on T-Mobile? Best take a good long look at Walmart as their new price for the Galaxy S III drops to $98. No, this isn’t a holiday promo as this pricing should last beyond the end of the Christmas holiday shopping season. This is a great deal and a better offer than even T-Mobile’s own pricing. The price is good for both new customers and qualifying upgrades. Head down to your local Walmart and treat yourself this holiday season, you deserve it. Thanks @phonedoggy for the image! Not really sure how this will work for retailers. It’s sad if Tmobile will actually be cutting their availability in major retail chains because they want to go value plan only. So I’m gonna return the phone I just bought and head over to Wal-Mart, so long as this deal is good for Value Plan upgrades. It is, right? And there’s nothing but the $98 to pay? Value plan can get you the phone financed and that is only done by t-mobile directly. No, this would put you under classic pricing and would still cost you more in the long run than T-Mobile’s value pricing on the galaxy s3. not always true, brandonjaye has to work out the math for it based on his plan/usage and see it its actually cheaper, and it depends on how often he plans to upgrade etc. Value Plans will not always cost lesser than Classic by a margin that merits the change, especially when its being sold for $98 as shown here. I agree! I got my S1 Vibrant free as a new classic plan customer from Best Buy on free phone fridays in Oct 2010! Im not sure about the exact math on that phone between classic and value plans but I know I came out cheaper on classic with this phone! But in this example it is a better deal on value. For unlimited everything and a galaxy s3 installment the value monthly is $90/month. Phone is $150 out the door, $50 mail in rebate deal before Dec 20. Phone paid off after 20 months. Classic plan for same unlimited everything is also $90/month. But instead of getting $20 cheaper forlast 4 months of your 2 year contract, like on value, the bill remains $90. So value will be $80 cheaper in the long run. Do the math. It might be cheaper to go Value in this case, however I didn’t see the OP mention he has the unlimited everything. For fixed minutes plans, Classic Plans will be cheaper. If he wants the Unlimited Everything plan, Costco would be cheaper as they have a promotion going on for that plan, and the SGS3 would be $29 after all rebates. Now I know some of you will excoriate me for this, but I went to the local Wal-Mart and this was not available for me. They need to differentiate between upgrades TO Value Plans from upgrades FOR Value Plans. The conjunction cost me 2 hours of my life. I left the t-Mobile store (oh, yeah, I was sent there from Wal-Mart under the notion I could get back an upgrade I didn’t really have) feeling like the explanation was just beyond the grasp of my salesperson. For everything I put into this, I should’ve just clicked endlessly at the Play store. 3rd party retailers are ONLY for Classic plan customers at this time. I probably should have waited for those responses, but I didn’t really have the time. Thanks for your help. Over thanksgiving through the first week of December it was $129 but came with a $100 gift card. Got two that way and used one of the $100 to pay for the other. Just charged tax and upgrade fee on top of that. On classic plan not unlimited, and was upgrade eligible. Nice price. For people looking for Value plans without financing, I see unlocked versions online for $500-$550 now. I know its nothing special but if you want this phone, there are options out there. I lost hope on the Nexus and with the upcoming value plans I decided to use my upgrade while I still have it. I went over to wal-mart during the weekend expecting to maybe walk out with the GSIII for $149 and that’s even if my grandfathered plans went through (I wasn’t too hopeful). Not only was I able to keep my grandfathered plans but it rang up $98 so with tax it was about $105. Great phone and definitely a step up from my G2. I didn’t like the plastic back at first but it’s nice and lightweight. Now I can’t put it down. Great deal if you can get it. Thats with a 3yrs plan,right? Can you use this for an upgrade and get the Android Preferred $20 data plan? why take the long way? if Mike in FL is a long term customer who feels he will qualify for the $20 Preferred Android, he might be better off getting the device from Loyalty/Retentions too, they might match or better the Walmart price. He could also ask for a few more freebies like a one month bill credit or something similar. When renewing a contract, ALWAYS spend time researching and seeing whats out there to leverage, especially for existing customers. A few hours spent searching can leads to several hundreds of dollars saved over the next 2 years..
Got mine at Walmart on Dec. 1st! Paid $148 before taxes and got a $100 gift card back on classic plan upgrade. Me, too, and I’ve been having a great time with it! David, once T-Mobile goes 100% Value Plans, will customers be unable to purchase phones using 3rd party retailers (Best Buy, Walmart) WIll the only way to get phones by by buying them from T-Mobile directly? I would suspect not, I can’t imagine any scenario in which T-Mobile cuts off the third party dealer, I just don’t know how they are going to handle phone sales with them. Going from dozens of distribution chains to a handful seems completely backwards, but I digress. Once your contract is over,you can go anywhere to get another one.And your number will be yours forever! (l’m talking abt Quebec,Canada).Carriers used to own the number you were given!! !So after your contract was over,u couldnt watch for the best deal out there cuz if u went to one carrier to another…bye-bye #!! !I hope its the same thing the US! What about if you wanted to add a line to an existing Classic plan? I have a question. Does anyone know if you get a corporate discount with Value plans? With me I have an old grandfathered plan with a discount and it actually comes out to less money than for a similar Value plan. Hopefully Tmobile will let me keep my old plan and then I will just have to buy phones if I need them. I still have Myfavs and they still come in handy so hopefully I will still get to keep everything the same. I figured I save close to $15 compared to a similar Value plan and even more to a classic. Corporate discounts are available on Value Plans, but not myFavs and Preferred Data. My guess is he might be better off with his existing plan, especially since he is not looking for a subsidized device. they don’t give you anything off the rate plan but it will waive the activation fee though and any special loyalty offer/preferred is also already at a discounted rate as well so same idea. You can get it off myfaves plans as long as it’s not a loyalty myfaves offer. Yes they do, it ranges from 5-15% depending on the company, and its applicable to all postpaid rate plans. They also waive the activation fee. The only catch is it will renew your contract, but not affect any EIP. Wish I waited for that price. I bought a One S for 98 at Sams about 2 to 3 months ago. I probably would have still sold it like I did with the One S.
ok so I am eligible for an upgrade but what I am understanding from this is that if I want to upgrade to a Value Plan (I am currently on a Classic Plan) I will not be able to because Walmart does not let you get Value Plans, they only let you get Classic Plans. Is that correct? Thanks for the quick response panther. Now one quick question. Do you think it would be smart of me to just go ahead and remain on the classic plan. Currently I am paying for 3 lines on a classic family plan about 160/month with taxes. I am getting ripped off. I went to the TMobile store this past weekend and they told me with a Value Plan I can get 2 lines unlimited talk/text and 2GB data for 50 each plus 1 line unlimited talk/text for 125 plus tax which would be less than like 140. Now I have no idea what the current Classic Plan prices are but I know for sure they are more expensive than Value plan pricing. When the Note 2 came out, I moved my 3 lines from Classic to Value. I was paying about $221 a month for unlimited everything and am now paying $146 for unlimited everything on two lines. The third line is 500 min w/ unlimited text and no data. I won’t pay anything for that line until Jan 2014. If you have done the math and the Value plan will save you $ monthly, I say go for it. Keep in mind though, that you will have to pay a migration fee to do so if you’re not near the end of your contract. Make sure you inquire into that. Check your past minutes/text/data usage and see if all your three lines need unlimited minutes/data whatever you have now. Call loyalty and see what offers they have, chances are they will give you a good deal. Compare what they offer with the Value Plans and then decide. Since you are a reasonably good ARPU existing customer with multiple lines, chances are good you will get a good deal from Loyalty. O we definitely need unlimited talk because we do not have a home phone anymore. Now I am on the line with a Tmobile Rep right now and she is pressuring me to get a new plan. My options are either 2 lines unlimited talk/text for 79.98 plus extra 25 for one line of talk/text so the total would be about 105 plus tax. And she is claiming I can add Data on 2 lines for 10/each. But if I take the data of and decide to add it later it will be 20/each. I don’t understand how people can say the Value Plan is always cheaper than Classic. There are several combinations of Classic (especially when the device is subsidized to the extent shown here) where the difference might not be worth the change. Each case is somewhat unique, its best to do your math based on what you really need, and other factors like how often you want new devices etc. Most people don’t really need unlimited minutes or data. The logic that out of contract Classic Plan customers pay more if they don’t upgrade is true yet anyone out of contract should ideally check for Loyalty plans, deeper discounts or maybe switch to the Value plan. But there is a reason 3rd party retailers still sell T-mobile devices and plans. … Because they work for T-Mobile and that’s what they’re PAID to say. I’m curious to know the answer this as well. I just bought the lg optimus l9 last Friday for 97 cents but I want to exchange it for the gs3. Same here, I do not even see the Galaxy S3 listed in the tmobile section of walmart’s site. I am looking specifically at the contract phones. looks like the holiday special is over! It is not $148 to upgrade or for new customers. The sale ended last Saturday is what the employee told me.